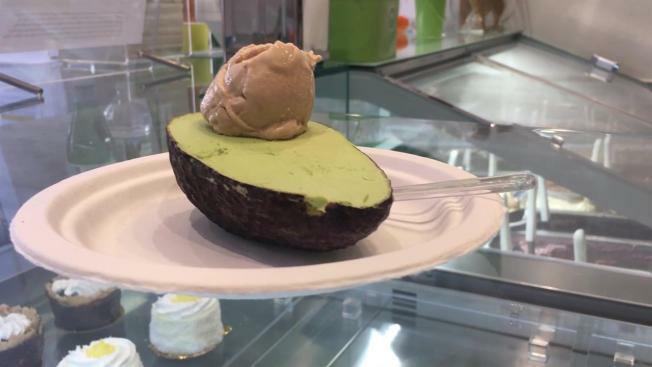 Polosud in Little Italy has released the first-ever vegan, avocado gelato. It is served in a real avocado shell, and the "pit" in the avocado is a scoop of gelato of your choice. The shop only sells 40 per day because of limited supply. Walk down a side street in New York's Little Italy and you might come across Polosud, a tiny gelato café tucked between a hair salon and an Australian restaurant. The tiny storefront certainly stands out with its fresh coat of green and white paint, but what stands out even more is the authentic gelato they’ve been serving up for years, and their newest creation — avocado gelato. For the past three weeks, Italian chef Giacomo D’Alessandro has been working away in the small kitchen of Polosud, trying to master the transformation of avocado into the perfect gelato, with the help of some additional spices. This simple combination and the use of fresh ingredients gives it its creamy consistency -- super light yet still satisfying. Even better — it’s vegan. D’Alessandro starts each one by scooping fresh avocado out of the shells, cleaning them out, and then putting them in the freezer to chill. A blend of lemon, cinnamon, sugar, and avocado is created fresh daily, and sets in the freezer for a few hours. After freezing the gelato, a hefty scoop of fresh avocado gelato is ladled into the frozen avocado shells and smoothed to look exactly like the inside of an avocado. The final touch is more personal. The avocado “pit” is customized, and can be one of the 21 classic flavors Polosud makes daily. It’s up to the customer to decide what they want that final touch to be, but D’Alessandro suggests the hazelnut. Although it was only introduced to the menu early last week, Polosud has seen success for it, especially since they have sold out every day since its launch.